Mortgage lenders are foreclosing on fewer homes in the Pahrump Valley as the market continues to recover from the economic downturn. The number of notices of default, a first step toward foreclosure, was 302 in 2015, down from 1,220 in 2010 and 1,379 in 2009. With fewer homes headed to foreclosure, the number of vacant homes to sell has also been decreasing steadily since 2011, recent data showed. Norma Jean Opatik, the broker with Realty Executives of Nevada, presented the numbers to the capital improvements advisory subcommittee that wanted to find out the number of vacant homes in the Pahrump Valley. In 2015, the number of vacant solds was 515 or slightly over 72 percent of all homes sold, down from 697, or 91 percent, in 2011. There is 188 vacant homes currently on the market. 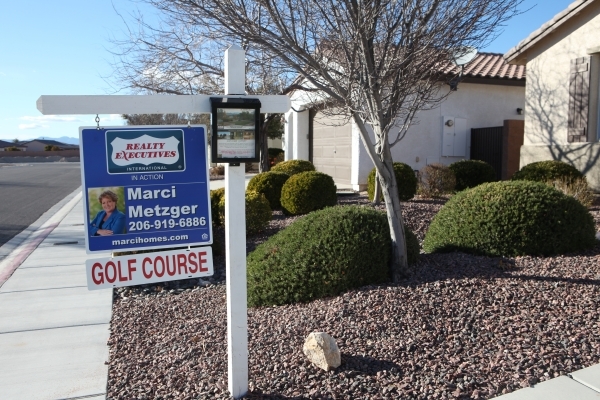 Overall, Pahrump saw 711 homes sold in 2015, up 50 from the previous year. Among those homes, 408 were single-family residences constructed on the lots, while the remaining 303 were manufactured homes. Opatik likened the current situation to 2004, when the housing market was hot. She said people in Mountain Falls have been moving around more frequently than those who live in other parts of the town. Opatik said while Pahrump sees retirees coming into town, younger families who live in Pahrump are suffering because of the scarce job market. The lack of a big commercial industry is one of the major impediments to the town’s progress toward attracting a younger demographic, officials said at the meeting. Darrell Lacy, director of the Nye County Planning Department, said there are a lot of reasons why Pahrump is having problems attracting industrial and commercial businesses. The comparison of development impact fees for Pahrump Regional Planning District (PRPD) that was prepared by the Nye County Planning Department in 2011 said that the impact fees for industrial buildings within the PRPD are much less than the U.S. national average, and well below many other Nevada jurisdictions, including Las Vegas, Mesquite and Reno. According to the document, impact fees, otherwise known as development impact fees are one-time monetary charges levied by local governments against new development to provide public infrastructure and facilities necessitated by and attributable to the new development. The impact fees for office buildings within the PRPD are lower than the averages in all states adjacent to Nevada, including California, Oregon, Idaho, Utah, and Arizona. Lacy said while the PRPD impact fees are cheaper, they often don’t include other charges such as road impact fees that add up down the road. Nye County’s impact fees are collected for the purpose of providing four categories of public improvements and facilities that include police stations, fire stations, parks and streets.